Are You Banging Your Head Against the Wall? Why? When you experience the same problem over and over, each and every day, you have to try and figure out a solution. If all you do is complain or vent about the same thing over and over -- go bang your head against the wall. That is what I did for 18 long months. I finally decided I had had enough. If you are like me, you probably felt like you could put everything you knew about Alzheimer's disease in a thimble the day you received the diagnosis. And, if you are like me, you probably thought that you had developed some skills over the course of your life that you could use and would help you to deal with a person living with Alzheimer's disease. In a world filled with Alzheimer's, you will need to learn how to engage in new and different kinds of communication while interacting with someone living the disease. Let me put it this way. You will need to do this if you are intent on remaining sane. You can use some of the communication tools you developed over the course of your life that work; and then, you develop new communication tools that you use while in Alzheimer's World. How long did it take before you could spell and pronounce the word cat? Well it might take a while before you learn how to use your newly developed communication tools effectively. C ah t.
Here are some things to consider right now. 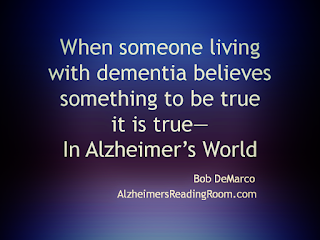 When someone living with Alzheimer's believes something to be true it is true -- in Alzheimer's World. Really doesn't matter if it is true in the Real World. Doesn't matter. Alzheimer's World is the place you go to when you want to communicate effectively with someone suffering from Alzheimer's disease. What a person living with Alzheimer's disease says might not be true in the real world -- as you know it. But, you are no longer communicating in the real world when you are communicating with someone living with dementia. Where are you? You could look at it this way. If you move to a foreign country and you don't learn the language you are going to feel bent out of shape a large fraction of the time. You might feel like you have a variation of Alzheimer's disease when no one understands what you are saying, and you don't understand what they are saying. Since you are the one in the foreign country it is up to you to adapt. Sooner or later you will learn how to speak this new foreign language. In the case of Alzheimer's, the person living with Alzheimer's disease is now living in Alzheimer's World -- they cannot adapt and you should not expect them to adapt. This leaves one alternative. You are the one that must adapt -- you are the one that has to change in order to communicate in the new foreign country you now live in -- Alzheimer's World. Of course, you can continue to communicate in the way you always have. Do you feel bent out of shape a large fraction of every day. Something has to change. If this is happening, I suggest you start banging your head against the wall -- 10 times a day should do the trick. Do it. I believe before long you will say, something has to change. It won't be hard at that point to say to yourself -- that something is me. When someone living with Alzheimer's repeats the same question for the tenth time, you'll learn once you make it to Alzheimer's World that they are asking you the question for the first time -- each time. Read that sentence closely. Did you actually realize this or are you driving yourself nuts. Let me make this simple. You might be hearing it for the tenth time, but they are asking it for the first time. If they remembered they just asked you, they wouldn't ask you again. Tip. They don't remember they asked, and they don't remember your answer. Why? Start banging your head against the wall. I guarantee your alternative solutions will start to sink in sooner or later. Don't trust me on this, go bang your head against the wall. 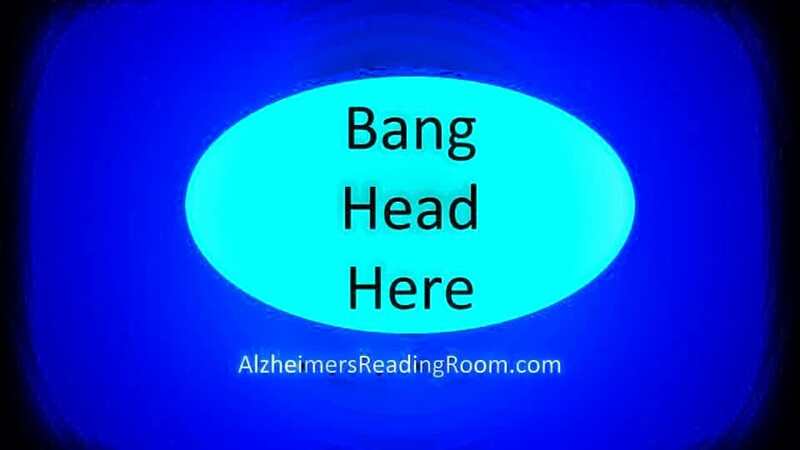 When you experience the same problem over and over, each and every day, you have to try and figure out a solution; if all you can do is complain or vent about the same thing over and over -- go bang your head against the wall. Ten or eleven times. something has to change and that something is me. If you are finding it difficult to deal with problems, or if you can't figure out a solution to a problem, you might consider joining a really good Alzheimer's support group. This is a good place to go for insight and advice about Alzheimer's. Or, you can just keep banging your head against the wall. Make sure you usea lternate sides when banging your head against the wall or you head might get lopsided. You don't want to spend all your time explaining to everyone in the Alzheimer's support group why one side of your head is flat and the other side isn't. Actually, don't worry. I assure you many of them will smile and shake their head up and down when they see you for the first time. I banged my head against the wall for 18 long months. I finally got sick and tired of doing it. I finally decided that something had to change. And then the obvious came to me in a flash.